Providing your children with a fun, safe and healthy environment is one of your top priorities. At Backyard Fun, we’re proud to help families throughout the Bay Area, Northern & Southern California realize their playtime dreams with custom swing sets, trampolines, basketball hoops and rubber mulch designed to provide hours of fun. As a local, family owned and operated business we believe that meeting and exceeding the expectations of families who shop with us is simply our duty. 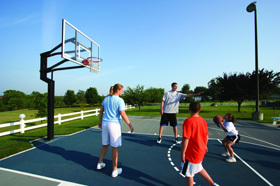 What child doesn’t love to play on play sets, swing sets, trampolines, or basketball hoops? All parents want their children to enjoy safe toys and backyard playground equipment. At Backyard Fun, we stand behind every item that we sell. We know that Rainbow Play Systems are the best on the market. We also know that they’ve been designed with the safety of your kids in mind. Whether you’re bouncing on one of our AlleyOOP or Vuly trampolines, swinging on a new swing set or shooting hoops with a custom basketball system, you’ll know that your whole family is safe while playing together. At Backyard Fun, we take the slogan Get Out and Play seriously. As a parent, you know that your child needs to get exercise every day in order to stay healthy. You also know that playing outside can improve your child’s mood and ability to focus on important tasks. When you choose outdoor play equipment, you’re deciding to give your child the opportunity to stay healthy and happy. We have a wide variety of safe and fun backyard playground equipment to help get your kids outside to play including: complete play sets, swing sets, trampolines, basketball hoops and even rubber mulch ground cover for their safety. No matter the needs of your family, we’re here to help you make the most of your backyard play time. We are proud to offer the full line of Rainbow Play Systems, the best in wood play sets and backyard play equipment. These complete play sets are built for safety, durability and lots of backyard fun. All of the Rainbow Play Systems have the option to be configured with a wood play structure, plastic slides, wood stairs, rope ladders, wood climbing walls, canvas play set covers, wood swing sets, and much more. Rainbow Play Systems have been manufacturing the finest residential play sets, swing sets, play structures and playground equipment for over 25 years. Their play sets and wood swing sets are made from the highest quality materials designed for safe, fun playground equipment. In addition, Rainbow Play Systems offers an industry leading warranty on all their play sets, wood swing sets and play equipment. And if you are worried about putting together your new play set, not to worry, we also offer installation on all of our play sets and wood swing sets. Create your own custom play set and we do the rest! Worried about fitting a play set in a small backyard? No problem, we have a wide variety of play sets that can fit in virtually any space. All of our play sets are build with a modular design making it easy to configure the perfect shape play set for your space. Take a look at our small yard solutions page for more info or visit our showroom to see one in person.